Good morning! I'm super excited this morning to be hopping with the Winnie and Walter Design Team and a few super guest stars to celebrate World Card Making Day! You should have arrived here from Amy Kolling - make sure and head over to the Winnie and Walter blog to start at the beginning if you just happened along. You are going to want to leave comments at every stop along the hop - there will be 5 winners of $25 gift certificates drawn from comments left along the hop. There will also be lots of different challenges on the Winnie and Walter blog with BIG PRIZES as well! Here is my card to share today - I made an attempt at no-line watercoloring, and considering how little I've done it, I'm pretty thrilled with how it came out! I stamped the large poinsettia from In Bloom: Elsa's Florals using Simon Says Stamp Barely Beige dye ink, then watercolored in with Daniel Smith watercolors. This ink made it easy, because it seemed to grab the color and add the detail right where the stamped line image was. YAY! I then stamped some evergreen boughs from the same set with distress ink to fit the watercolor feel, and added some splatters with the same distress ink by mixing it with some water to flick on. I added a sentiment from Merry and Bright with Evelin T. Designs, and a few of the snowflakes from that set as well - stamped off once with black ink for a softer effect. I die cut the entire panel using Essentials: Katharine Cutaways and distressed the edges before mounting on a kraft cardbase. Finished off by adding Glossy Accents to the center of the flower and snowflakes and sprinkling on some crushed glass glitter for some sparkle! Your next stop along the hop is Miriam Prantner - have a wonderful time hopping, and Happy World Card Making Day!!! Your card is so beautiful ...Love your no line coloring ! Beautiful! Lovely colors/coloring with the perfect bit of sparkle! The glitter adds a gorgeous touch! Breath-taken-away beautiful! Swooning over your poinsettia! Wow! Really beautiful poinsettia card. Breathtaking! Your flower looks almost 3-dimensional. Thank you so much. That's nice. Would love to get for thr holiday. The shading on the poinsettia is wonderful. Beautiful poinsettia card design! I like the texture with the sparkly embellishments. Great job with the coloring. Stunning poinsettia. Beautiful coloring. Love the pine sprigs that you added. This is so very pretty!! I have yet to try the no-line coloring technique, but you have inspired me!! Beautiful poinsettia card. I love the added snowflakes. Stunning poinsettia card, love it, have never tried the no-line colouring but I must. 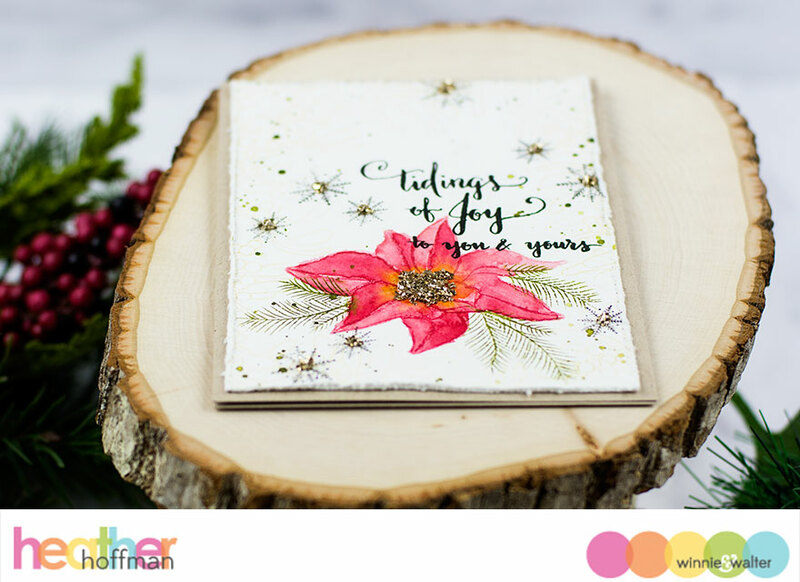 Love the way you have coloured the poinsettia it makes a great focal for your card. Such a beautiful card!! I love it! That card is beautiful !! No-line coloring looks wonderful! I love the kraft base, distressed edges and the glitters combination! Lovely, elegant, sweet, pretty...I need more adjectives to continue. Thank you. Simply gorgeous! Happy World CardMaking Day! Such a pretty job. Your watercoloring is awesome! Just gorgeous. Love the colors in the poinsettia. Thanks for the ideas. 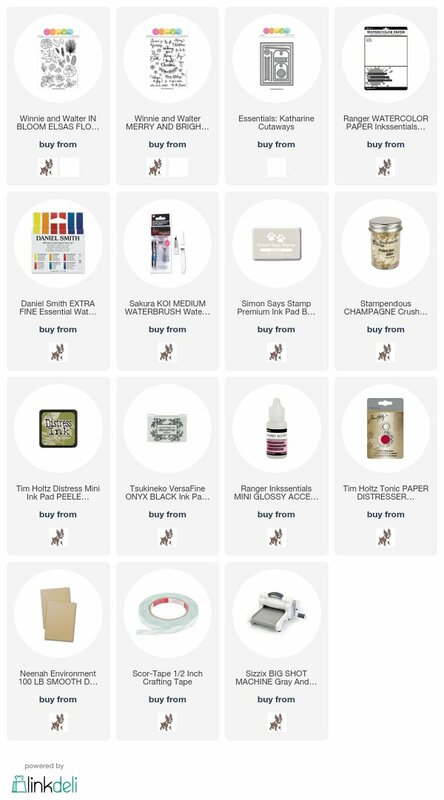 I am just dying to buy that stamp set, but I spent too much today. Argh! LOVE your poinsettia! WOW - your stamping gives amazing dimension too! So very, very beautiful. You can't go wrong with poinsettias on a Christmas car. The gold sparkles add such lovely interest. great card! time to get started on my Christmas cards! Your no line coloring is beautiful. You should do it more often. WHOA! HEATHER! This is a SHOW STOPPER! STUNNING! Just love the font of the sentiment! This is a lovely card! Poinsettias are always in style for Christmas and so pretty done in watercolor!! You knocked this out of the park! Thanks for sharing! This is a great release!! Happy World Cardmaking Day! Beautiful design. That poinsettia is gorgeous. Gorgeous card! Love the simplicity which makes it look so classy! Your card is so pretty! 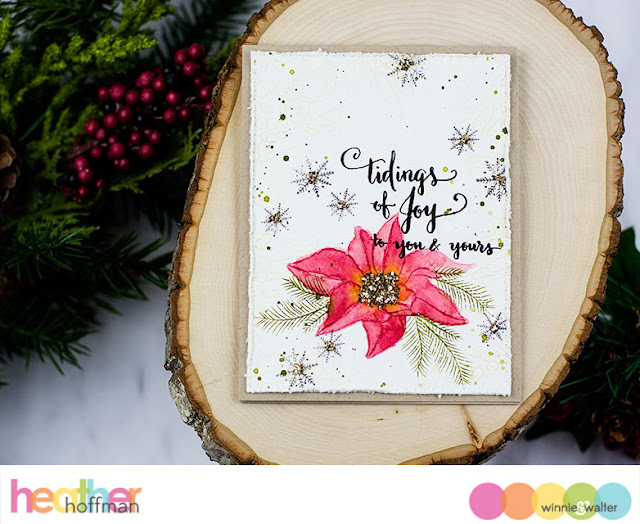 Love the snowflakes and that poinsettia is beautiful! Simply gorgeous card! Love it! Thank you! An amazing card! Now on my Christmas cards Pinterest board! Lovely card! Love that gorgeous poinsettia! Beautiful balance with the flower, sentiment and embellishment! What a gorgeous card!! The no-line technique is beautiful and how you did it with the Daniel Smith colors is stunning! Love the addition of the leaves and the distress ink splatters. You did a FABULOUS job at no-line coloring. I love the big chunky middle of the poinsettia. I really love you card. Very pretty! I really like the way you did the center of your flower. Thanks for sharing your lovely card. Thanks also to Winnie & Walter for all the fun WCMD activities. Happy World Cardmaking Day! This card is absolutely spectacular!! gorgeous card...love the little touches of sparkle. This is a beautiful card! I love the Elsa's Flora stamp set for this time of year! I haven't tried no-line coloring yet but your poinsettia is so pretty and delicate looking! Beautiful card. Love the coloring and the background. Beautiful card and colouring. Love the black and white background with the pop of colour. Beautiful--I like your no line coloring and the sparkle. 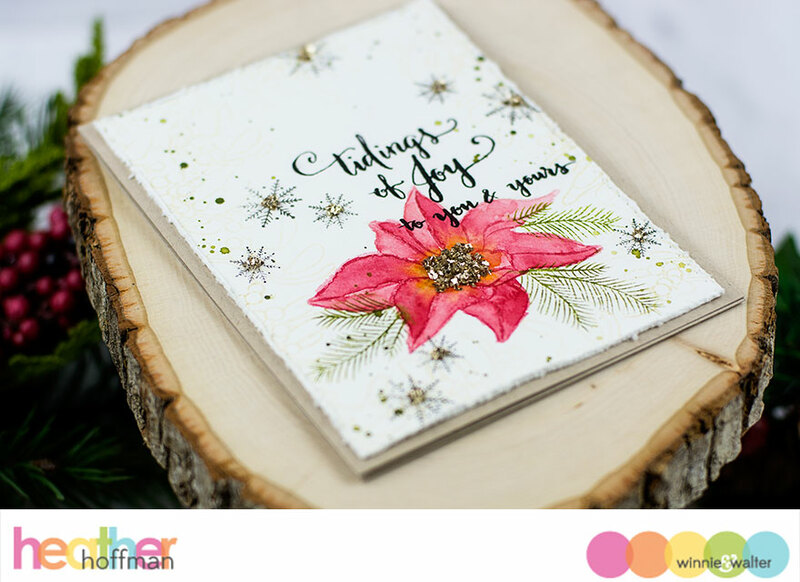 Gorgeous, love the addition of the subtly stamped snowflakes. Beautiful card and lovely coloring! !